By the time this medal was created, medals had been used in Italy for over a century as a way of circulating the images of important individuals, including popes. In the sixteenth century the practice spread to Germany, with important centres of medallic production developing in Nuremberg and Augsburg. German medals carried portraits of princes and private individuals, and were also widely used by supporters of the Reformation. Although both sides of this medal are dated 1545, various differences between them suggest that the two sides were created separately. Evidently, the status of Luther and Melanchthon as the two leading figures of the German Reformation then led to the two images being combined into one object. 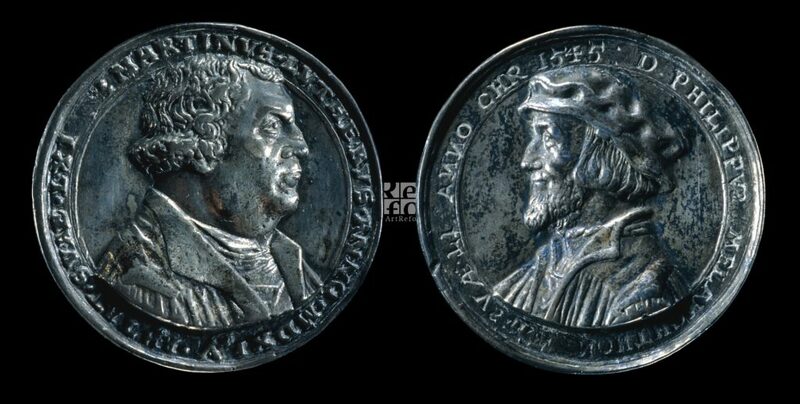 Other medals bearing these two portraits carry the same wording on the side portraying Luther, whilst the inscription around Melanchthon emphasises the importance of religious faith in bringing us to God. Here this has been replaced with an incised inscription that identifies Melanchthon and links the two portraits to a particular year.